Multicast and broadcast service (MBS) is one of the important services for next-generation wireless systems. In WiMAX, the radio resource unit (i.e., time, frequency, code, etc.) for MBS is centralized allocated by an anchor access service network gateway (Anchor ASN-GW). In MBS, a BS can dynamically join or leave an MBS Zone due to the moving of MSs. The Anchor ASN-GW must allocate nonoverlapping radio resource units to BSs for delivering different MBS contents in overlapping MBS Zones. 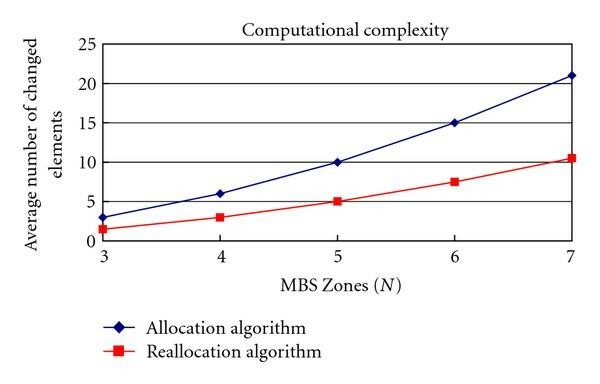 This paper presents radio resource allocation and reallocation algorithms to minimize the number of required resource units for overlapping MBS Zones. For a given number of MBS Zones, a resource estimation model is also presented to estimate the average number of radio resource units to be reserved by the ASN-GW. Simulation results showed that the proposed algorithms can reduce the number of reallocations, and, thus, the signaling messages exchanged in the air interface and the core network are minimized. The results also showed that the proposed model can be used as a good reference for the network operator to estimate the average number of required radio resource units for a given number of MBS Zones. Multicast and broadcast service (MBS), or multimedia broadcast/multicast services (MBMS), is one of the important services to be supported by the next generation cellular systems. MBS is a point-to-multipoint service, where data packets are transmitted simultaneously from a single source to multiple destinations . MBS provides an efficient usage of radio/spectrum resources via transmitting the same data through a common broadcast or multicast channel. Potential MBS services include streaming services, file download services, and carousel services (combination of streaming and file download services aspects with repetition and update to reflect changing circumstances) . Normally, the MBS content is transmitted over a geographical area identified as a zone. A cluster of base stations (BSs) that transmit the same content in a zone is referred to as an MBS Zone. In an MBS Zone, the contents are identified by the same identifiers (IDs) and security association (SA) . Hence, a mobile station (MS) in either connected state or idle state can continue to receive the content within the MBS Zone without reestablishing an MBS connection . For MBS Zone containing multiple BSs, it can be operated in either macro-diversity or non-macro-diversity operating mode. In macro-diversity operating mode, all BSs belonging to the same MBS Zone should be synchronized at the symbol level (i.e., with timing errors within the cyclic prefix length) to transmit identical MBS contents using the same modulation and coding . In non-macro-diversity operating mode, synchronized transmission is not required, but the same MBS content is coordinated to be transmitted in the same frame. Each BS could be a member of more than one MBS Zone. Two MBS Zones are overlapped if there is at least one BS belonging to both zones . In MBS, a BS can dynamically join or leave an MBS Zone due to the moving of MSs. A BS may decide to join a nearby MBS Zone if a user requests for a new MBS service that is not existed in this cell but is available at this MBS Zone. In contrast, a BS which serves no MS may not have to deliver MBS content. As a result, the BS may decide to leave an MBS Zone and release the occupied radio resource. Figure 1 shows an example of three overlapped MBS Zones. For each MBS Zone, an access service network gateway (ASN-GW) is responsible for controlling and allocating radio resource (i.e., which is defined in terms of time and subchannels) for its subordinate BSs. For the network with multiple MBS Zones, the allocation is done by an Anchor ASN-GW . 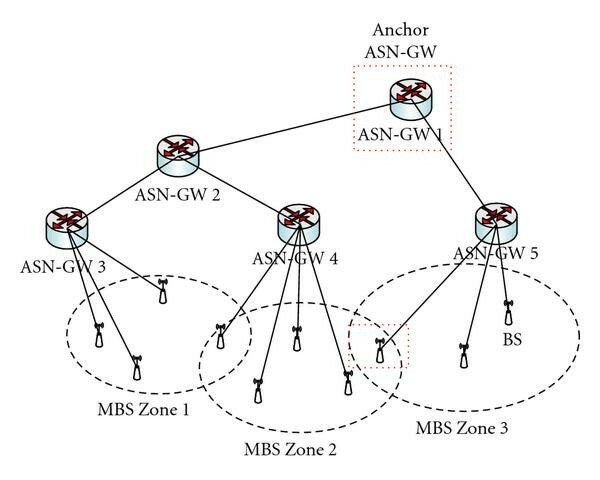 In Anchor ASN-GW, a coordinating scheduling function is used to coordinate the transmission of MBS content across the entire set of the BSs that belong to the same MBS Zone. It has to reserve nonoverlapping radio resource units such that BSs belonging to multiple MBS Zones may transmit individual MBS content without confliction. There are two main constraints for allocating radio resources for MBS. First, the same radio resource unit may not be allocated to BSs to deliver more than one MBS content simultaneously. Second, the number of radio resource units required by the MBS Zones should be minimized. MBS Zones and their associated Anchor ASN-GW. The conflict-free radio resource allocation problem can be generally modeled as a vertex coloring problem . Coloring is an NP-complete problem for arbitrary random generated graphs . Several approaches have been proposed to reduce the complexity via adding certain constraints. Woo et al. proposed a method to divide a bus network into a number of subnetworks such that nonconflicting requests can be processed concurrently. A vertex coloring algorithm is then used to enable parallel communications. Walczak and Wojciechowski  proposed a scheduling method in multihop packet radio networks. They used a DSATUR graph coloring algorithm to determine a virtual path and find the conflict-free optimal scheduling. Zheng and Hoang  modeled the overlapping WLANs as a planar graph and used the Distance-1 vertex coloring technique to find the minimum number of reuse groups. In these approaches, the authors mainly focus on graphs with limited colors (e.g., two colors are considered in , and at most four colors are involved in ). In addition, the topologies considered in these approaches are rarely changed. Similarly, the radio resource allocation in overlapping MBS Zones can also be modeled as a vertex coloring problem. However, each BS may have to transmit multiple MBS contents in a single frame, and thus results in a rather complex topology. The topology may also be dynamically changed due to the moving of MSs. Hence, existing methods cannot be directly applied here. This paper presents radio resource allocation and reallocation algorithms for overlapping MBS Zones. In initialization, the Anchor ASN-GW uses the radio resource allocation algorithm to allocate radio resource unit for a given topology. A radio resource reallocation algorithm is then used to minimize the reallocated resource units due to the change of topology. The key point in this paper is the proposed reallocation algorithm utilizing colors assigned in the previous round to reduce the amount of color reassignment. The reduction in the number of reallocated resource units not only reduces the computational complexity but also minimizes the signaling overhead exchanged in the air interface and the core network. The rest of the paper is organized as follows. In Section 2, a system model is presented, and the proposed radio resource allocation and reallocation algorithms are elaborated. In Section 3, a resource estimation model is proposed to estimate the average number of radio resource units to be reserved for a given number of MBS Zones. Simulation results were shown in Section 4. The number of reallocated resource units and the computational complexity of the proposed radio resource allocation algorithms were investigated. The accuracy of the proposed resource estimation model was also verified. Section 5 summarizes the paper. Figure 2 shows the system model used in this paper . In this model, the topology of MBS Zones is represented by an undirected labeled graph, where each vertex represents an MBS Zone and the edge connecting two vertices indicates the overlapping of two MBS Zones . The conflict-free radio resource allocation for overlapping MBS Zones can then be modeled as a vertex coloring problem, where each color represents a radio resource unit. The graph should be colored in a way that no two adjacent vertices share the same color. Note that different topologies may map to the same nonisomorphic graph as shown in Figure 3. In Figure 3, four network topologies map to the same nonisomorphic graph. Therefore, the resource allocation for these topologies is identical. In other words, the resource allocation in overlapping MBS Zones is to deal with the coloring problem for Nonisomorphic graph. Different topologies maps to the same nonisomorphic graph. Note that the adjacency matrix is symmetric; that is, . The purpose of the radio resource allocation and reallocation algorithms is to find the resource unit vector (coloring vector) for such that the used resource units are minimized. The proposed radio resource allocation algorithm allocates radio resource units to each MBS Zone according to their degree. Therefore, conventional greedy coloring algorithms (e.g., Welsh-Powell algorithm ) can be easily adopted to determine the resource unit vector for a given MBS Zone topology. 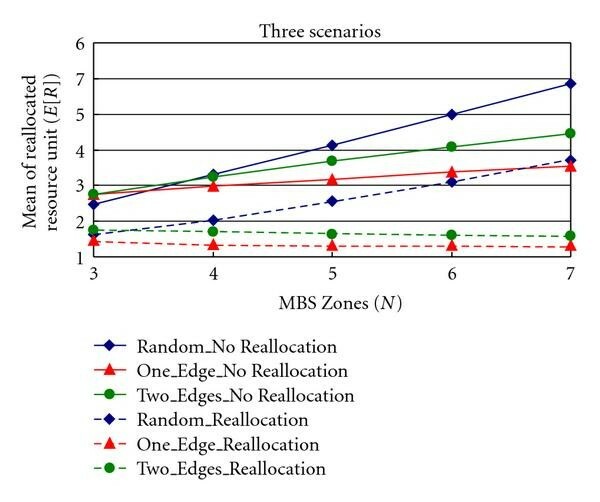 However, the radio resource reallocation algorithm further considers the correlation between the old and the new MBS Zone topologies to minimize the number of reallocated resource units. Hence, it will only re-allocate the radio resource to those MBS Zones with modified edges. In the following, a matrix operation is proposed for Anchor ASN-GW to implement the allocation algorithm. The steps implementing the radio resource allocation/reallocation algorithms are summarized as follows. For a given adjacency matrix , set . Assign one resource unit to each MBS Zone. Initially, every vertex is uncolored. Let . The resource unit vector set is . Determine , where is the color matrix of the previous MBS Zones, is the color matrix of the current MBS Zones, and is a given constant that is no less than . Focus on only the MBS Zones that have updated their topology, which are indicated by the non-zero elements in (i.e., the degree vector of matrix ). Note that newly added edges are indicated by elements with negative value in , while newly deleted edges are indicated by elements with positive value in . Start from the MBS Zone that has the maximum value in , that is, . The reallocation may result in a conflicted decision at MBS Zone if the two zones are overlapped and use the same resource unit; that is, . assign a nonconflicted resource unit (try to find a used resource unit first and may use a new resource unit if no used resource units can be selected) to MBS Zone (i.e., set it to a resource unit number). For elements in the th row/column in that is greater than (i.e., , which represents newly deleted edges), set its value to zero (i.e., or ), and set (it indicates that some edges may be removed later). Repeat the process performed in Step 3 based on non-increasing order of degree of the MBS Zone until all elements in are positive and none of them is greater than . Then utilize Step 2 of the radio resource allocation algorithm to deal with MBS Zones that do not assign resource units (i.e., for some ). Execute this step only if . For those MBS Zones that remove their edges, try to reuse a nonconflict resource unit used by another MBS Zone that does not remove its edge. Repeat this process until those MBS Zones are all examined. The reallocated resource unit vector is . An example illustrating the proposed radio resource reallocation algorithm with and is shown in Figure 4. Initially, the resource unit vector is . Follow the steps of the resource reallocation algorithm, the updated resource unit vector can be found as . Hence, only one resource unit is reallocated. In contrast, the updated resource unit vector can also be found using the resource allocation algorithm, which gives , and the reallocated resource unit increases to two. The procedure of the radio resource reallocation algorithm. According to the definition of the polynomial given in (10), the possible number of nonisomorphic graphs for a graph of 4 vertices with different edges can be obtained from (15); that is, it has one nonisomorphic graph with zero edge, one nonisomorphic graph with one edge, two nonisomorphic graphs with two edges, three nonisomorphic graphs with three edges, two nonisomorphic graphs with four edges, one nonisomorphic graph with five edges, and one nonisomorphic graph with six edges, as shown in Figure 5. From Figure 5, it was found that there are six nonisomorphic graphs that require two colors. In other words, six kinds of MBS Zone topologies require two radio resource units. The eleven nonisomorphic graphs for a graph with 4 vertices. The number of nonisomorphic graphs with different edges for a given number of MBS Zones can be determined from the generating function given in (10). Table 1 summarizes the number of nonisomorphic graphs with different edges for a given number of MBS Zones. 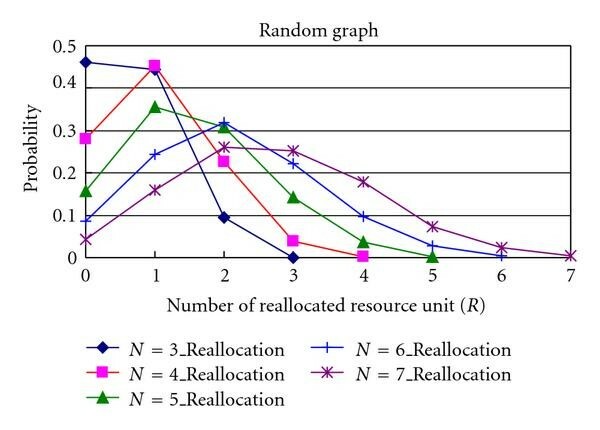 The number of radio resource units required for each nonisomorphic graph can then be determined by using the resource allocation algorithm proposed in Section 2. The results are summarized in Figure 6. In Figure 6, the notation of represents that there are different nonisomorphic graphs and each of them requires radio resource units. The number of nonisomorphic graphs for a given number of MBS Zones with different edges. The number of nonisomorphic graphs ( ) and the required radio resource units per nonisomorphic graph ( ) for overlapping MBS zones, . The denominator part of (16) can be found by setting and in the generating function in (10). In the above example, . The numerator part of (16) can be calculated based on Figure 6. Finally, is derived for to 7, and the results are summarized in Table 2. The probability of a nonisomorphic graph using resource units in MBS Zones, . With (18), the network may adjust the number of reserved radio resource units based on a given number of MBS Zones. Simulations were conducted on top of a C-based simulation platform to verify the effectiveness of the proposed method. In the simulation, MBS Zones were investigated. Each sample was obtained by averaging 10000 outcomes, and each outcome was collected based on the result of an initial topology and a new topology. The initial topology was randomly generated such that every two MBS Zones may be connected with a probability 0.5. The initial topology is then modified to be a new topology in order to evaluate the effectiveness of the radio resource reallocation algorithm. Three topology modification scenarios were considered in evaluating the effectiveness of the proposed radio resource allocation algorithm. In Scenario I, the new topology is randomly generated, and, thus, there is no correlation between the two topologies. In Scenario II, the new topology is modified by adding/removing an edge to/from the initial topology. In Scenario III, two-edge modifications are preformed for the initial topology. In the simulation, the radio resource of the initial topology is always allocated by using the proposed radio resource allocation algorithm. However, the radio resource of the new topology may be allocated by using the proposed radio resource allocation or reallocation algorithm. The performance of the reallocation algorithm is measured in terms of the number of reallocated resource units , which can be calculated from (9). In the simulation, the number of radio resource units found in the allocation and reallocation algorithms is the same as the optimal value that can be found by a greedy coloring algorithm. Figure 7 shows the performance of the radio resource reallocation algorithm for the three topology modification scenarios. In this figure, dotted lines were used to indicate results if reallocation algorithm is adopted. In contrast, the solid lines were used to indicate results without adopting reallocation algorithm. It was found that the average number of reallocated units is proportionally increased with if reallocation algorithm is not used. It is because a higher generally requires more radio resource units. In contrast, the average number of reallocated units found by the reallocation algorithm always results in less reallocated resource units in all of the three scenarios. Performance of the radio resource reallocation algorithm. In Scenario I, the performance of the reallocation algorithm is not significant due to the lack of correlation between the initial and new topologies. However, the reallocation algorithm still has a better result. It is because reallocated algorithm always reuses the resources allocated to the initial topology. Therefore, less modification is needed. Significant improvement can be found in Scenario II and Scenario III. In these cases, the number of reallocated resource units does not change with the increasing of . It is mainly due to the high correlation between the two topologies. Figures 8 to 10 show the probability density functions for the number of reallocated resource units for the three topology modification scenarios. Figure 8 shows the probability density function of the reallocated resource units, , required by a randomly generated new topology for different values of . It can be found that the possible value of is in the range from 0 to ( ) because the reallocation algorithm can always reuse one of the radio resources assigned to the initial topology. Probability density function of : random graph scenario. Figure 9 demonstrates the results of a new topology with one-edge modification. 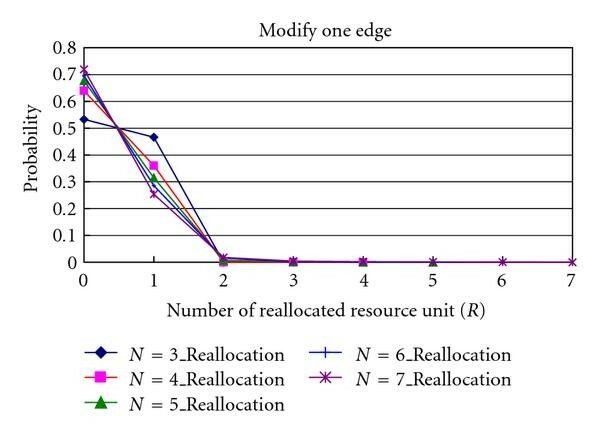 The maximum number of reallocated resource units is one because only one edge is modified. In the application, the topology of MBS Zones is changed if any one of its edges is modified. Hence, we may use the correlation between the two topologies to minimize the number of reallocated resource units and, thus, reduce the signaling overhead. In this figure, it can also be found that the probability of reallocated one resource unit increases if decreases. It is because the impact of topology modification is significant for smaller . Note that no resource unit reallocation is needed in more than 50% of the one-edge topology modification cases. Probability density function of : one-edge modification. Probability density function of : two-edge modifications. Similar result for the two-edge modification was shown in Figure 10. In this case, the number of reallocated resource units may not exceed two. The probability of re-allocating two resource units is still less than 0.15 for all values of . Even in this case, more than 40% of the two-edge modifications do not incur any resource reallocation. The computational complexity of the proposed resource allocation and reallocation algorithm was illustrated in Figure 11. The computational complexity is measured in terms of the number of changed elements in the adjacency matrix for the initial and the new topology. Due to the symmetric property of the adjacency matrix, only the elements in the upper triangular of the adjacency matrix are counted. The worst case performance was investigated (i.e., the new topology is randomly generated), and the results show that the reallocation algorithm may reduce about 50% of the complexity than that of the allocation algorithm. Computational complexity of the proposed algorithms. The accuracy of the proposed resource estimation model was then investigated. In the first simulation, the initial topology of MBS Zones was randomly generated. Each MBS Zone was assumed to connect to another MBS Zone with probability 0.5. A random graph scenario was simulated for from 3 to 7. 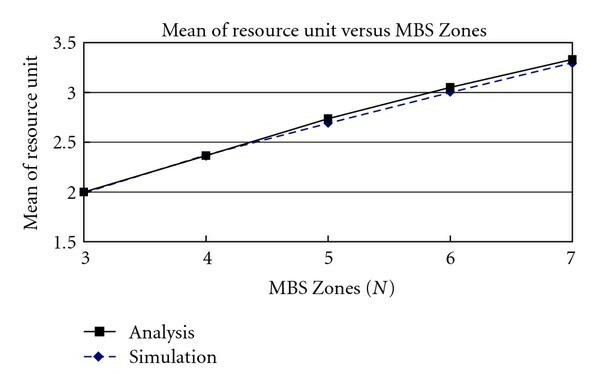 Figure 12 showed the average numbers of radio resource units required for different numbers of MBS Zones. It was found that there is no big difference between the analytical and simulation results. Hence, the proposed estimation model may be used as a good reference for reserving the radio resource from the mean-value point of view. The detailed statistics were further explored, and the results were shown in Figure 13. In Figure 13, the number of resource required for each nonisomorphic graph for a network with four MBS Zones (i.e., ) was investigated. The results of eleven nonisomorphic graphs were presented. In this figure, Edge_2_1 refers to the nonisomorphic graph with two edges and needs one color. 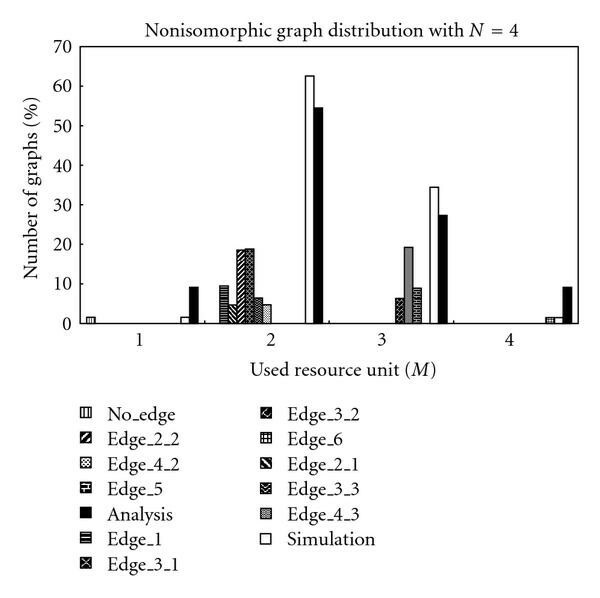 The simulation and analysis results included all nonisomorphic graphs requiring the same resource unit. It was found that, although the analysis coincides with the simulation results from the mean-value point of view, the simulation and analysis do not follow the same distribution. It implies that the uniformly distribution assumption for the nonisomorphic graph is oversimplified. The simulation results further showed that each nonisomorphic graph will not generate with an equal probability. Average number of the required radio resource units in different MBS Zones. Eleven nonisomorphic graphs for a graph with four vertices. This paper presents methods to allocate and re-allocate radio resource units for overlapping MBS Zones. 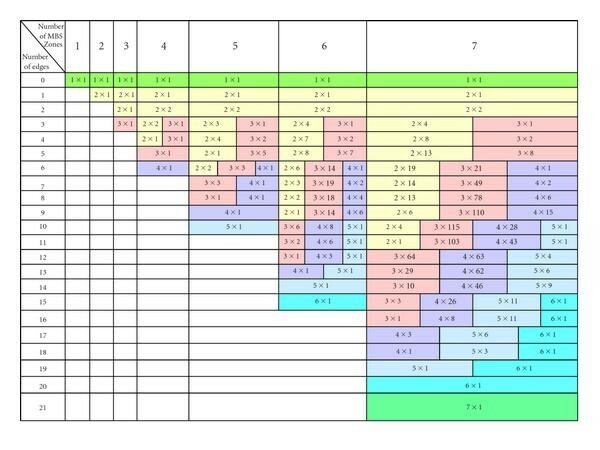 We use an adjacency matrix to represent the topology of overlapping MBS Zones. A radio resource allocation algorithm is first proposed to allocate radio resource units to an arbitrary topology containing MBS Zones. A radio resource reallocation is then proposed to re-allocate resource in response to the changing of MBS Zone topology. 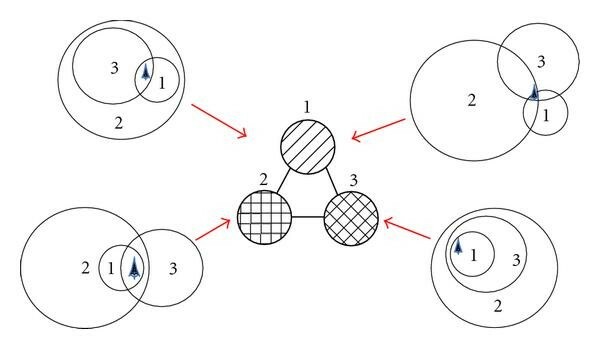 The reallocation algorithm utilizes the correlation between the old and the new topologies to minimize the number of reallocated resource units. It reduces the computational complexity as well as the signaling overhead in the air interface and the core network. This paper further presents an estimation model to estimate the mean of resource unit in overlapping MBS Zone. The estimation is obtained based on a simple assumption that each nonisomorphic graph is generated with an equal probability. Simulations were conducted to evaluate the effectiveness of the proposed algorithms. 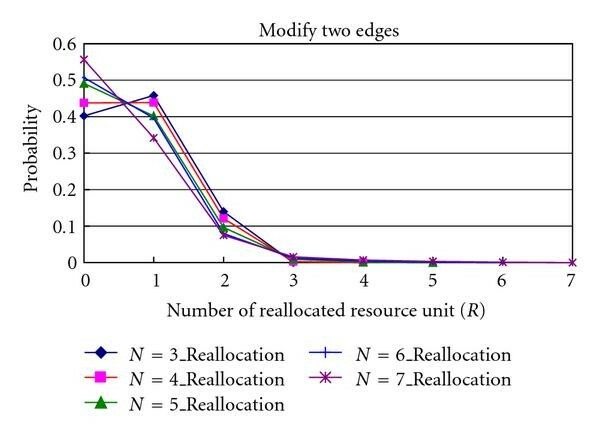 It was found that the proposed resource reallocation algorithm may greatly reduce the number of reallocated resource units for various topology modification scenarios. The performance of the reallocation algorithm is significant if only one or two edges of a given topology are modified. It can also be found that more than 40% of the two-edge modifications do not incur any resource reallocation. The worst case study of the computation complexity further shows that the proposed resource reallocation algorithm may reduce about 50% of the complexity than that of the allocation algorithm. The results also showed that the proposed model can be used as a good reference for the network operator to estimate the average number of reserved radio resource units during MBS initialization. This work was supported in part by the National Science Council, Taiwan, under Contract NSC 98-2219-E-011-005, 99-2219-E-011-005 and by the Information and Communications Research Laboratories, Industrial Technology Research Institute.